Genuine HARKAWAY Bluestone pool pavers and matching pool coping in the Melbourne suburb of Portsea. Pool pavers in white granite contrasted against genuine HARKAWAY bluestone pool coping… SIMPLY SUPERB! Simply MAGNIFICENT! This swimming pool in the leafy Melbourne suburb of Berwick has Harkaway bluestone drop down pool coping tiles and white granite pool pavers. This swimming pool is by far the best we have seen in this area of Melbourne. Designed by the owner with an eye for detail. We specialise in hand made customised curved pool coping. We of course have matching pool pavers. In this case we have custom made bluestone pool coping to match the curved pool. Crazy paving has been used to a great affect around this swimming pool in the leafy Melbourne suburb of Olinda. Pool pavers and pool paving need not be in the structured format of squares and rectangles. 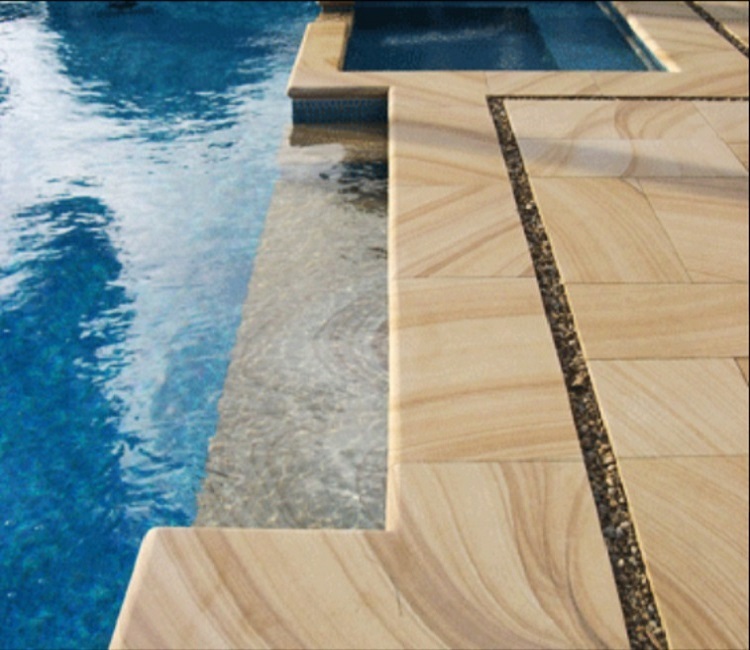 Teakwood sandstone pool coping and matching pool pavers have been used to stunning affect around this pool renovation in the Melbourne suburb of Dromana. Bluestone drop down pool coping surround this architecturally designed swimming pool in the Sydney suburb of Lane Cove.